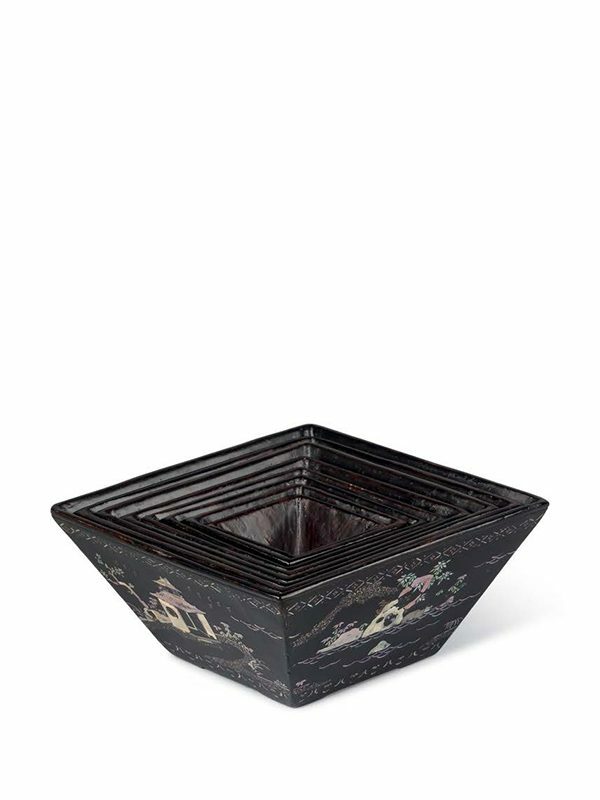 A set of eight graduated black lacquer cups, each of square section with slanting sides rising from a flat base. The base of the largest cup has four shallow bracket feet. The sides of each cup are inlaid with tiny iridescent pieces of mother-of-pearl and gold-foil lozenges. The six large cups are decorated with scenes of figures in a landscape setting with abundant vegetation and pavilions, whilst the smallest two cups are adorned with bats flying amongst the clouds. The scenes are framed at the top and bottom by bands of formal pattern. This set of mother-of-pearl lacquer cups is a rare example, both for its well-preserved condition and also for its unusual square form. As observed by Zhang Rong, the combination of highly iridescent pieces of mother-of-pearl with a brightly coloured tint, sometimes coupled with miaojin (the use of gold foil), is characteristic of Qing dynasty pieces. The square, slanting form of this unusual set of lacquer cups is sometimes referred to as ‘rice-grain measure (doubei)’, especially popular during the Jiajing reign of the Ming dynasty (1521 – 1567), and was mainly used as wine cup. A single lacquer cup of the same form with inlaid mother-of-pearl designs on a gold ground is in the Muwen Tang collection. 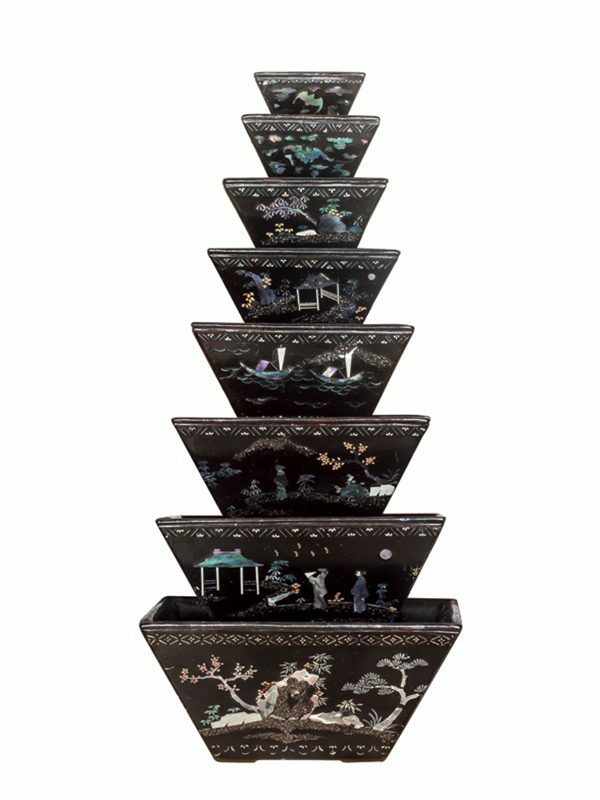 A set of seven graduated mother-of-pearl inlaid black lacquer cups with closely comparable figures-in-a-landscape scenes and decorative borders, but of ingot shape, is in the same collection (fig. 1).